10 tripods in 28mm or 1:56 scale. 10 vehicle 7.62mm MG3 machine guns in 28mm or 1:56 scale. 10 vehicle MILAN launchers 28mm or 1:56 scale. 10 vehicle TOW launchers in 28mm or 1:56 scale. One German TPz Fuchs in 28mm or 1:56 scale. One West German Jagdpanzer (Raketenjagdpanzer) Jaguar 1 or 2 tank destoyer in 28mm or 1:56 scale. One West German Keiler (Leopard 2 prototype) in 28mm or 1:56 scale. One West German Light Artillery Rocket System (LARS) in 28mm or 1:56 scale. 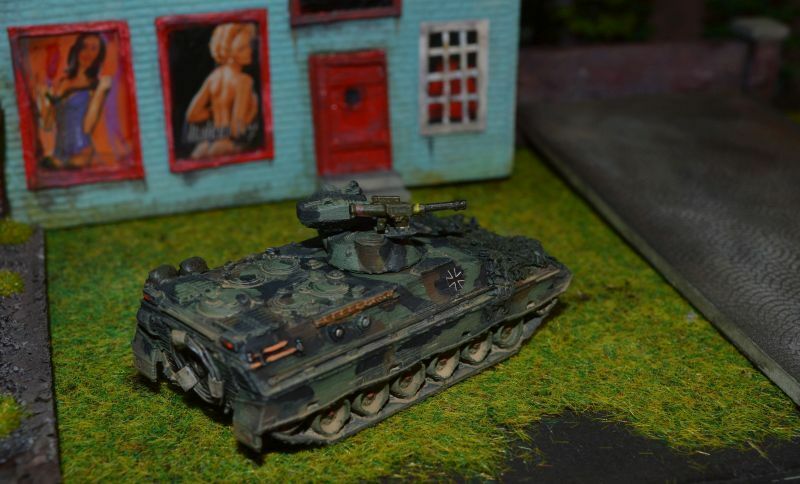 One German Leopard 1 in 28mm or 1:56 scale. One German Leopard 2 in 28mm or 1:56 scale.